252/2, 1st Floor, Sai Prithvi Cyber Arcade, Opp. ICICI Bank ATM Centre, Madhapur, Hyderabad – 500081. ANDHRA PRADESH, INDIA. It is the right time to enhance your skills in project management and improve career prospects by opting for the specially developed PMP Certification Training Course Hyderabad by Vinsys. It will be held in Hyderabad from Sep 22nd to Sep 30th. The PMP certification is regarded as the de facto global certification for project mangers worldwide. With this certification, you can handle a multitude of projects with aplomb. This certification enhances your job prospects by a huge margin and it is recognized globally. You also become well equipped to assess various types of projects for viability and risk-which is beneficial to the organization. 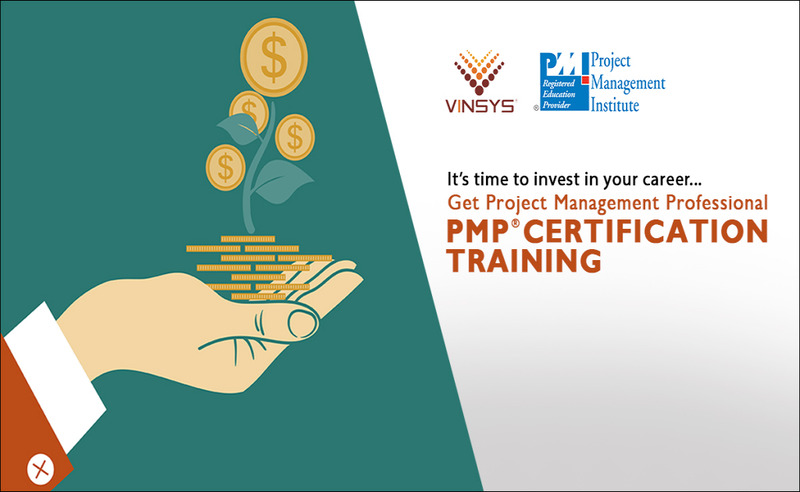 PMP Training from Vinsys enhances your prospects for obtaining this much sought after certification. Project managers with relevant experience usually opt for Online PMP Certification Training and exam. The PMP certification enhances your project management skills. You become well versed in nuances of project management like planning, assessment, risk checking and execution etc. The PMP Certification Training Courses help you acquire a consistent approach in project handling which can benefit the organization in many ways. With this certification, you can deal with projects of many types, whether those are exalted with IT or not. The PMP certification is not regions specific in nature. So, with this certification you will face no problem in locating job in any country. After obtaining PMP Certification Classroom Training and getting the certificate, you can bag really high paying jobs. The PMP certified professionals find it easier to get plum jobs in top companies, literally anywhere. With this certification, you can also expect to get a boost in remuneration in the organization. Since the PMP course mixes technical expertise with skills in management, it is deemed better than regular management degrees. It is natural for the companies to prefer PMP certified candidates. The PMP certified professionals ensure projects run without hitting hurdles. They can figure out loopholes in project plans better than others prior to execution and come up with apt solutions if anything goes awry.